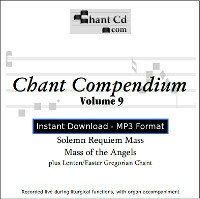 Add Chant Compendium 9: Solemn Requiem Mass, plus Lenten and Easter Gregorian chant to your cart! 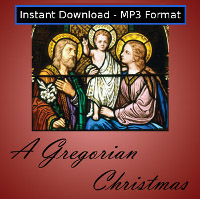 Now available as a downloadable MP3 album! 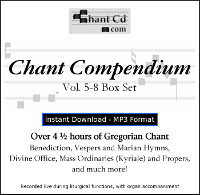 Download your CD in minutes, save $5, plus you avoid shipping charges! 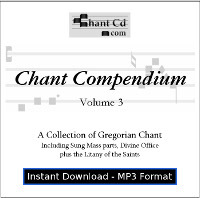 Chant Compendium 9 is the latest release in the widely acclaimed Chant Compendium series of live Gregorian chant with organ accompaniment. Volume 9 includes all of the sung parts of the centuries-old Solemn Requiem Mass (Mass for the Dead) for a total of 31 minutes. 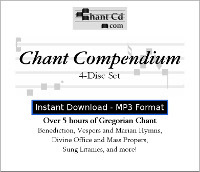 The other half of the CD is 35 more minutes of all-new Gregorian chant recordings including 2 traditional Catholic hymns. By popular demand, this CD includes Mass VIII, or the Mass of the Angels, so you can enjoy listening to the most famous Kyrie, Gloria, Sanctus, and Agnus Dei. And Chant Compendium 9 is extremely useful to help you prepare for Holy Week and Easter: it contains a version of Parce Domine for Lent, the famous Palm Sunday chant Gloria Laus et Honor, and then at the Paschal Vigil you can hear the full Exultet sung by a Deacon as well as the priest intoning the first Alleluia of the season. 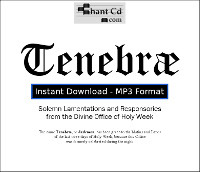 The CD finishes with The Strife is Oer, a classic traditional Catholic hymn for Easter, and To Jesus Christ Our Sovereign King which is a hymn every Catholic should learn. Where appropriate, tracks have organ accompaniment. 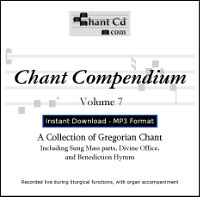 Includes the following Gregorian chant: Solemn Requiem Mass Introit, Kyrie, Gradual, Tract - Absolve, Dies Irae, sung Gospel, Offertory Domine Jesu Christe, Sanctus, Preface, Pater Noster, Agnus Dei, Communion, In Paradisum, Libera Me, complete Mass of the Angels (Kyrie, Gloria, Sanctus, Agnus Dei), Parce Domine, Gloria Laus et Honor, Sung Exultet (Paschal Vigil), Alleluia from the Paschal Vigil, plus two traditional Catholic hymns: The Strife is Oer, and To Jesus Christ Our Sovereign King.